To understand computer architecture, it is necessary for you to have a basic understanding of electronics. All the amazing things that can be done with electronics are the result of one simple thing - electric charge. Electric charge comes in two forms, positive and negative. A positive charge is the electrostatic field radiated by protons. A negative charge is the electrostatic field radiated by electrons. 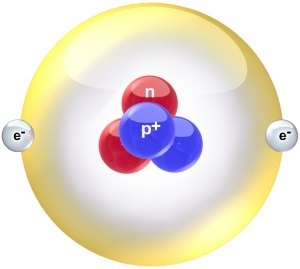 The basic construction of an atom, the particle of which all matter is made, is a central nucleus containing protons surrounded by outer shells created by electrons orbiting the nucleus. The power that comes from electricity is caused by the fact that same charges repel each other and opposite charges attract each other. In other words, two protons repel each other, two electrons repel each other, but an electron and a proton attract each other. The nucleus of an atom can contain many positively charged protons, along with many neutrally charged particles called neutrons. You might ask, "if same charges repel each other, how does the nucleus stay together?" The repulse force of the protons in the nucleus of an atom is overcome by a nuclear force called the "strong force". Interestingly, there is another force acting in the nucleus of an atom called the "weak force" that eventually overcomes the strong force, allowing protons to leave the nucleus. The weak force is responsible for radioactive decay. The strong force and the weak force in the nucleus of an atom is caused by quarks. A quark is a sub-atomic particle of which protons are constructed. But in our effort to learn basic electronics, we don't want to delve too deeply into nuclear physics, so let's just stick with the fact that atoms are constructed of a nucleus containing positively charged protons and neutrally charged neutrons, and the nucleus is surrounded by shells of orbiting negatively charged electrons. Sometimes the shell of orbiting electrons is referred to as an "electron cloud". One important fact is that the nucleus of an atom is relatively heavy. That's because a proton is about 1800 times more massive than an electron. The reason this is important is because electricity primarily involves the flow of electrons. The nucleus of an atom generally doesn't move much. The atoms of some elements hold onto their electrons tightly. These elements are called "insulators". The atoms of some elements, like copper and aluminum, hold onto their electrons loosely, especially the electrons that orbit in the outer shells. It is these electrons that tend to break loose and can be used to create electron flow. Elements that hold onto their electrons loosely are called "conductors". There is a third type of material, elements like germanium and silicon, that sometimes conduct and sometimes don't, and sometimes conduct some but not fully. It depends on how you treat, or "bias" them. These materials are called semiconductors and they are responsible for much of our modern electronics. But we won't delve into semiconductors in this basic introduction. There are two basic types of electron flow - direct current (DC) and alternating current (AC). DC current flows in one direction, from a more negatively charged location to a less negatively charged location. Since same charges repel each other, negatively charged electrons will flow in an attempt to get as far away from each other as possible. With AC current, the flow of charge reverses direction periodically. The rate of this reversal is measured in cycles per second, a unit referred to as Hertz (Hz). The AC power used in a house has a reversal rate, or frequency, of 50 Hz.